Journal Reference: Liu P, M Song, T Zhao, S Gunthe, S Ham, Y He, Y Qin, Z Gong, J Amorim, A Bertram, and S Martin. 2018. "Resolving the mechanisms of hygroscopic growth and cloud condensation nuclei activity for organic particulate matter." Nature Communications, 9(1), 10.1038/s41467-018-06622-2. Thermodynamic model predictions for hygroscopic growth, phase separation, and CCN activation of an α-pinene-derived secondary organic particle. Predicted volume fractions of hydrophilic, hydrophobic organic components, and water are shown in panel (A) for the surface and in panel (B) for the core of the particle. For comparison, panel B also shows the volume fractions of water calculated based on the mass-based QCM measurements of hygroscopic growth. (C) Kohler curves predicted with or without LLPS. Measured critical supersaturation values of CCN activation are shown for comparison. This study provides new measurements on how organic aerosol particles take up water and serve as cloud condensation nuclei, and explains the observed complex thermodynamic behaviors using a simple thermodynamic model. This study reconciled the discrepancy between sub-saturation hygroscopicity and super-saturation cloud condensation nuclei activity for organic aerosol particles. The key to the explanation is the phase separation between hydrophobic and hydrophilic organics and the induced surface tension lowering. The results are essential for the assessment of the aerosol indirect effect on climate. Hygroscopic growth and cloud condensation nuclei activation are key processes for accurately modeling the climate impacts of organic particulate matter. Nevertheless, the microphysical mechanisms of these processes remain unresolved. Here we report complex thermodynamic behaviors, including humidity-dependent hygroscopicity, diameter-dependent cloud condensation nuclei activity, and liquid-liquid phase separation in the laboratory for biogenically derived secondary organic material representative of similar atmospheric organic particulate matter. These behaviors can be explained by the non-ideal mixing of water with hydrophobic and hydrophilic organic components. 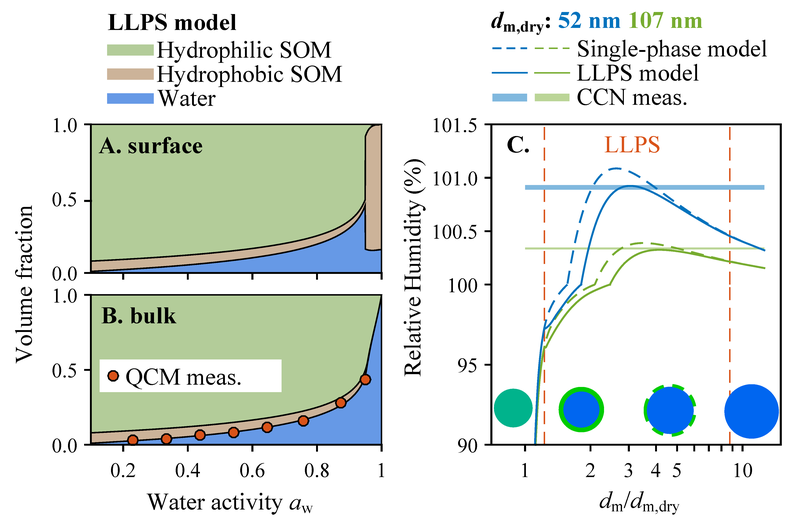 The non-ideality-driven liquid-liquid phase separation further enhances water uptake and induces lowered surface tension at high relative humidity, which results in a lower barrier to cloud condensation nuclei activation. By comparison, secondary organic material representing anthropogenic sources does not exhibit complex thermodynamic behavior. The combined results highlight the importance of detailed thermodynamic representations of the hygroscopicity and cloud condensation nuclei activity in models of the Earth’s climate system.